Brand loyalty is a bankable commodity. For decades, automakers have relied on it to sell cars. Repeat business is the name of the game and Maryland resident Walt Ziffer has been a good player. 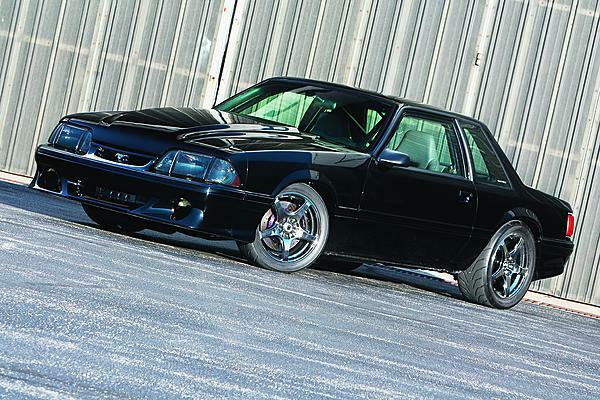 A fan of the Blue Oval, he has, over the years, owned four well-massaged Fox-body Mustangs. His latest ride is this black ’88 LX. Ziffer originally purchased this ’88 LX as a half-finished rolling chassis from his close friend Howard Pasternak. “It was completely disassembled down to the unibody shell, without any glass, wiring, interior, or suspension,” he recalls. “It was just a shell with a fresh coat of black paint and an unpainted cage.” At the time, Ziffer owned an ’83 convertible that had been heavily modified for drag racing. The ’83 ragtop was great in a straight line, but the owner was looking for a more well-rounded package. He wanted a user-friendly, purpose-built show, road and race car. As the manager of the Potomac Café Racers club, which is affiliated with the Sarasota Café Racers, the idea of bringing the ’83 to shows was logistically impractical. 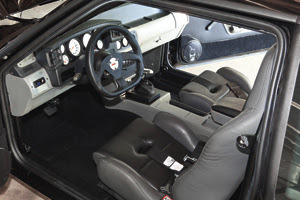 He points out, “the goal was to build a stock-appearing Fox-body coupe that would run 9s on DOT tires, handle like a road racing car, and stop like my Porsche 911 Turbo.” Yeah, you read correctly, a Porsche 911 Turbo. It was also modified. Right from the beginning, the yardstick was long and the humble LX had some mighty big performance shoes to fill. Half the battle of the build was accomplished with the purchase of the partially finished car. The biggest challenge was to take the drivetrain from the ’83 and modify it for its new task. That responsibility was handed over to Maryland Performance Center. They started by building a beefy bottom end for the engine. A Cola 4340 forged crank was installed in the Ford Racing R302 block, along with Oliver billet rods, and a set of JE forged 9.2 compression pistons. A pair of Canfield aluminum heads fitted with 2.08 intake valves and 1.60 exhaust valves crowned the top end. 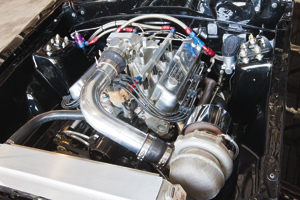 The bumpstick of choice was a custom-ground roller camshaft from COMP Cams with a .555-inch intake and .555-inch exhaust and 273 degree duration. This combination needed some serious feeding capabilities. With that in mind, they added an Edelbrock Victor 8.2 lower manifold, along with a Wilson upper manifold. FAST 85 lbs/hr fuel injectors and a FAST EFI system with a 90mm throttle body dispense the fuel. An Alky Control methanol injection system handles the cooling of the pressurized air when the boost begins to build in lieu of a less efficient inner cooler. Everything is sparked to life with an MSD 6A1 box. Forcing all this hardware is a massive Turbonetics T76 turbo that is fed by custom stainless steel headers and pipes. The spent gases exit via a custom single four-inch exhaust system that is mated to a Borla race muffler. 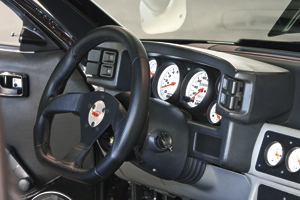 Power distribution was also carefully planned and various options considered, however, in the end they chose a Lentech AODE four-speed automatic with a 3,600-rpm stall converter and transbrake. A custom-length aluminum driveshaft transmits the power to a rear end stuffed with 3.27:1 gears, 35-spline axles, and a Traction Lok differential. In terms of handling, the Mustang got beefed up at all four corners. Up front, a Maximum Motorsports coilover front kit, tubular A-arms, K-member, and Koni adjustable shocks were installed. Taming the nervousness of the rear axle is critical in raising a Mustang’s performance level, so Maximum Motorsports adjustable upper and lower control arms, with an adjustable sway bar, were dropped in to aid in planting the power to the ground. All this hardware needed additional stopping power. The stock brakes were tossed out in favor of Wilwood six-piston calipers at the front, and Wilwood four-piston calipers at the rear, which harmoniously clamp down on 13-inch rotors. The last piece of the power delivery equation was the wheel and tire choice. Ziffer went with a set of black chrome Enkei RP03 17-inch wheels wearing 215/45-17 Toyo Proxes R888s up front. Out back, he went with a set of Enkei RP03 18-inch wheels wrapped in 245/40-18 Toyo Proxes R888s. He has two options in fueling the car. It can either run on 93 octane gasoline or high octane racing fuel. George Reggio at Maryland Performance dyno tuned the engine on 93 octane fuel with a safe tune, which resulted in over 700 rear wheel horses and 700 pounds of torque. If it is drinking the good stuff, 110 octane plus, that number jumps up to over 900 rear wheel horses without pushing the motor to its limit. Reggio knows that Ziffer often likes to drive the ’88 near its performance limit. As a preventive measure, so the car doesn’t leave him stranded, he designed the system to lock out electronically from overriding the boost and ECU settings. Ziffer knew from past unpleasant experiences, like a broken block and blown head gaskets, that Reggio was saving Ziffer from himself by limiting the boost. The entire project took him three years to complete. Some of that time was spent chasing down all the missing parts needed to complete the car. As for future plans, an updated engine management system that includes traction control and a boost controller is on the list. Many ask him to compare the Mustang and Porsche. He points out that, “Both have that long, flat luxurious torque curve that seems to go on forever. The Mustang has manual steering and manual brakes, which work very well, but the precision of the steering, braking, and handling of the Porsche is unlike anything I have ever driven. I wish the Porsche sounded like the Mustang at full throttle. Great car you got there. Its very rare that some car owners uses gasoline fuel and some shift to off road diesel fuel because they find it more cheaper and efficient. What do you think? you for sharing! I hope you will continue to have great articles like this to share with everyone!